Srimad Ananda Tîrtha, also known as Sukha Tîrtha, Pûrnabodha, and Pûrnapragnya, is the founder of the doctrine of Tattvavâda. He is the last of the great Achâryas of Vedanta, and is also the 22nd commentator on the Brahma-Sûtra of Veda Vyâsa. His doctrine asserts, as has already been noted elsewhere, that the differences are eternally real, and that hence there is more than one absolute real, and that Hari (Vishnu) is the only entity praised in the Shrutis and their adjuncts. Thus, he always identifies the Brahman of the Upanishads with Vishnu, and forcefully argues against the dichotomy of Shrutis (tattvâvedaka / atattvâvedaka) as claimed by Sri Shankarâchârya, saying that such arbitration of apaurusheya scripture is unacceptable both logically and spiritually. He also emphasizes that it is important to understand and specifically reject other schools' precepts, and hence devotes much time to nitpicking analyses and denunciations of other doctrines. Srimad Ananda Tîrtha is commonly identified with Madhva, the third avatâra of Mukhya PrâNa, the god of life, as given in the BaLitthâ Sûkta of the Rg Veda. The first two avatâra-s are as Hanumân and Bhîmasena, and the third is Madhva, who came down to Earth as a sanyâsî, in order to avoid decimating the forces of evil (as he had done on the previous two occasions, and as he would have done again -- upsetting the flow of Kali Yuga in the process -- if he were not a sannyâsî). Srimad Ananda Tîrtha himself makes the claim to being Madhva in several instances, one of which is in the Vishnu-tattva-vinirnaya verse given on the cover page of this section. It was recognized in his own time, and it has been documented, that he had all two-and-thirty shubha-lakshaNa-s that define a rju-tâttvika-yogî, including the prescribed height of six-and-ninety inches ("shaNNavati angulo.apetam") quoted in the Mahâbhârata-Tâtparya-Nirnaya. However, he is firmly set against the notion of accepting doctrines because they come from prophets or claimed gods -- he refuses to accept that it is possible to derive a meaningful spiritual system based on any but the apowrusheya texts (the Vedas/Upanishads/Shrutis) and their adjuncts (the Iti-hâsas, PurâNas, etc.). He also dismisses claims that only part of the Vedas are useful, and claims that even the so-called karma-kâNDa portions of them are only meant to worship Hari. The earliest and most authentic biography of Srimad Ananda Tîrtha is the Sumadhva-Vijaya, a.k.a. Madhva Vijaya, by NârâyaNa Pandita, the son of his close disciple Trivikrama Pandita. There are other English biographies by C. M. Padmanabhachar, C. N. Krishnasvami Ayyar, S. Subbarao, and C. R. Krishnarao, among others, but these are not truly independent efforts, since they draw very deeply upon NârâyaNa Pandita's work. Madhva was known as Vâsudeva, as a child, and was born in response to a prayer by some brâhmana-s of the Bhâgavata sampradâya, as a result of which Vishnu, who Himself does not incarnate during Kali Yuga, ordered His chief aide Mukhya PrâNa a.k.a. Vâyu to go to Earth, and rescue the mumukshu-s from the unrelenting deluge of the illusionist schools. Therefore, Vâyu was born in Pâjaka-kshetra, near Udupi (in modern Karnataka state), to Madhya-geha Bhatta. Even as a child, he was extraordinary in every respect, and repeatedly astounded his teachers, and performed several miracles, a notable one being when he freed his father from the clutches of a loan shark, by giving him a handful of tamarind seeds which satisfied the latter completely. He also killed the demon MaNimanta, who attacked him in the form of a snake, by crushing the snake's head under his toe. At the age of eight or thereabouts, he announced to his parents his intention to take up sanyâsa, and on noting their distress at this pronouncement, promised to wait until another son was born to them. Finally, at the age of eleven, upon the birth of a younger brother (who many years later joined his order as Vishnu Tîrtha) he was ordained into sanyâsa, whence he was given the name Ananda Tîrtha by his guru Achyutapreksha Tîrtha, a.k.a. Achyuta-pragnya Tîrtha. Soon afterward, when his guru attempted to educate him, he astounded the former by his knowledge. 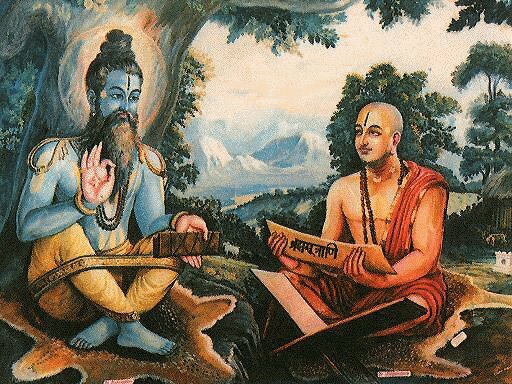 It is said that when his guru tried to teach him the noted Advaita text IshhTa-Siddhi, he pointed out, to Achyutapreksha Tîrtha's amazement, that there were 30 errors in the very first line of that work, where its author Vimuktâtman pays obeisance to himself by saying something like: "The only truth is the soul's empirical knowledge. In the presence of this truth the world appears to be an illusory play. The essential soul manifests itself as I, you and everything..."
It was this profound knowledge of all subjects that earned him the title of "PûrNa-pragnya," for "the one of complete wisdom." The initially discomfited but finally greatly pleased Achyutapreksha Tîrtha soon gave up trying to educate the master, and himself made a full conversion to Tattvavâda, under the name Purushottama Tîrtha. Srimad Ananda Tîrtha is known for his skill at debate and repartee, which were amply evident when he roundly trounced all opponents who dared take him on. One early convert to his school was Shobhana Bhatta; after losing to Madhva in debate, he accepted the latter as his Guru, and was given sanyâsa under the name Padmanâbha Tîrtha. Two other noted opponents whom PûrNapragnya defeated in debate and converted to ardent devotees, were Trivikrama Pandita, and Shyâma Shâstri -- the latter accepted sanyâsa as Narahari Tîrtha. Madhva made two trips to Badarikâshrama, the abode of BâdarâyaNa a.k.a. Veda Vyâsa, and on the first, obtained the imprimatur of BâdarâyaNa Himself for his Bhâshya on the Bhagavad Gita, when the latter made the correction "vakshyâmi leshataH" ("I state infinitesimally"), in place of "vakshyâmi shaktitaH" ("I state as best as I can"). He also founded the Krishna temple at Udupi, when he rescued by his spiritual power a ship in distress on the high seas, and got from its captain the apparently useless gift of a large mound of gopi-chandana mud that had been used as the ship's ballast, and which broke open to reveal the long-concealed icons of Krishna, Durga, and Balarâma. This is believed to be the occasion when he composed the Dvâdasha Stotra, a set of twelve stotra-s in praise of Vishnu that is collectively counted as one of his seven-and-thirty works. There are many notable incidents on record involving Srimad Ananda Tîrtha, and it is futile to hope that a short piece like this one can capture even the essence of his mission correctly. However, in brief, two of them are the ones where he lifted and displaced a boulder weighing tons that was obstructing some construction; an inscription ("Anandatîrthena eka-hastena sthâpitâ shilâ") made on the boulder at the time attests to the event to this day. On another occasion, he led some disciples to a spot where he showed them the long-buried weapons of the PâNDavas, including the great mace he had wielded to telling effect as the mighty Bhîmasena. Visual evidence, if one may call it that, of Srimad Ananda Tîrtha being Madhva, the avatâra of Vâyu, was obtained by Trivikrama Pandita when the latter had the great fortune to observe the three forms of Vâyu worship simultaneously -- Hanumân worshipping Râma, Bhîmasena worshipping Krishna, and Ananda Tîrtha worshipping Vyâsa. On that occasion, Trivikrama Pandita composed the Hari-Vâyu Stuti, also called just Vâyu Stuti ("shrimadvishhNvaN^ghrinishhThâ atiguNa gurutama shrimadânandatîrtha ..."). Madhva himself validated the Vâyu Stuti by adding the mangalâcharaNa shloka-s, called Narasimha- nakha stuti ("pântvasmân.h puruhûta vairi balavan.h ..."), to be chanted in the beginning and at the end of the Vâyu Stuti. This very short work of just two shloka-s is counted as one of his thirty-seven grantha-s.
Srimad Ananda Tîrtha disappeared from amidst an audience, after giving a lecture on the Aitareya Upanishad, on the ninth day of the shukla paksha in the month of Magha in 1317, and now is permanently in Badarikâshrama, where he serves his master Bâdarâyana in person.